When you wear this cold shoulder dress, you are the life of the party. This dress certainly isn’t one you would wear to work, but it is super fun piece that I think matches my personality. This cold shoulder dress is a crisp white with colourful trim and I literally giggled when I saw it. I paired this cold shoulder dress with a fun pair of Keds that are equally as colourful. I used a stunning solid colour bag to complete the look. Easy peasy! This wonderful rainbow wall in Houston was created by the talented Sebastien “Mr. D” Boileau of Eyeful Art & Design. This is not to be confused with the Biscuit Paint Wall, by the same artist, that I was photographed at in this post. 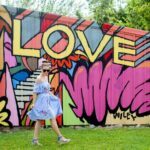 If you are fond of murals, you should check out the Wall Wanderings : Houston Mural Guide that we released this week! Be sure to follow @wall_wanderings on Instagram, and share your colorful wall photos using the hashtags #WearWhereWellWallWanderings and #WWWWallWanderingsHOU. Keep looking up. There may be a rainbow waiting for you. I hope you have a great Wednesday. The great thing about a long weekend is the short week that comes along with it. I have been baking a lot lately and have so much to share…soon!